One of the much awaited films of the season, Nani’s Jersey got its trailer released today, and only one word that is being heard about this film is that it is a straight bull’s eye for the Natural star. Let’s have a look at the trailer right away. Apparently, the story of the film is about a man who lost his place in the cricket team and then retired to his life. But 10 years post his exit from cricket, he slipped into a position where he steals money from his wife’s wallet. And then, he decides to become a cricketer again. 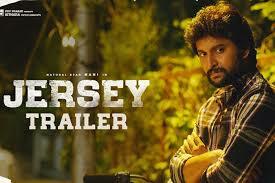 This is the story, completely revealed in the trailer, but the biggest showpiece of this story is none other than Nani. The myriad of emotions he has portrayed is just awesome. No other substitution to the superlative ‘Natural Star’. Cut to other departments, Anirudh’s terrific background score and Sanu Verghese’s mindblowing cinematography are the big backbones for the movie. And we have to appreciate director Gowtham Tinnanuri for bringing out such an emotional drama with cricket backdrop, which many youths will relate to.